Simon & Schuster, 9780684844169, 592pp. "Way Out There in the Blue" is a major work of history by the Pulitzer Prize-winning author of "Fire in the Lake." Using the Star Wars missile defense program as a magnifying glass on his presidency, Frances FitzGerald gives us a wholly original portrait of Ronald Reagan, the most puzzling president of the last half of the twentieth century. Reagan's presidency and the man himself have always been difficult to fathom. His influence was enormous, and the few powerful ideas he espoused remain with us still -- yet he seemed nothing more than a charming, simple-minded, inattentive actor. FitzGerald shows us a Reagan far more complex than the man we thought we knew. A master of the American language and of self-presentation, the greatest storyteller ever to occupy the Oval Office, Reagan created a compelling public persona that bore little relationship to himself. The real Ronald Reagan -- the Reagan who emerges from FitzGerald's book -- was a gifted politician with a deep understanding of the American national psyche and at the same time an executive almost totally disengaged from the policies of his administration and from the people who surrounded him. The idea that America should have an impregnable shield against nuclear weapons was Reagan's invention. His famous Star Wars speech, in which he promised us such a shield and called upon scientists to produce it, gave rise to the Strategic Defense Initiative. Reagan used his sure understanding of American mythology, history and politics to persuade the country that a perfect defense against Soviet nuclear weapons would be possible, even though the technology did not exist and was not remotely feasible. His idea turned into amultibillion-dollar research program. SDI played a central role in U.S.-Soviet relations at a crucial juncture in the Cold War, and in a different form it survives to this day. Drawing on prodigious research, including interviews with the participants, FitzGerald offers new insights into American foreign policy in the Reagan era. She gives us revealing portraits of major players in Reagan's administration, including George Shultz, Caspar Weinberger, Donald Regan and Paul Nitze, and she provides a radically new view of what happened at the Reagan-Gorbachev summits in Geneva, Reykjavik, Washington and Moscow. FitzGerald describes the fierce battles among Reagan's advisers and the frightening increase of Cold War tensions during Reagan's first term. She shows how the president who presided over the greatest peacetime military buildup came to espouse the elimination of nuclear weapons, and how the man who insisted that the Soviet Union was an "evil empire" came to embrace the Soviet leader, Mikhail Gorbachev, and to proclaim an end to the Cold War long before most in Washington understood that it had ended. 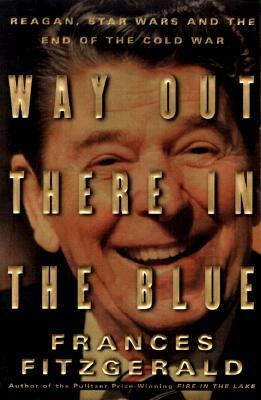 "Way Out There in the Blue" is a ground-breaking history of the American side of the end of the Cold War. Both appalling and funny, it is a black comedy in which Reagan, playing the role he wrote for himself, is the hero.